"Made of stainless steel that won't rust, this colander can strain both spaghetti and fine foods like rice." "Extendable nonslip handles fit across the sink so you can rinse vegetables and keep the colander safely above the floor of the sink." "If your colander needs are simple, this strainer fits the bill — and the budget." "Made to last with riveted handles that offer a firm grip." "Collapses just 1 1/2 inches tall, for storage in a cabinet or drawer, but at its full size it holds 4 quarts and has a non-slip base." "Does the job while taking a lot less storage space, and it clips on snugly without damaging nonstick surfaces." "The inner basket is removable and makes rinsing berries easy." "A comfortable handle and a head that’s the right size and shape for scooping into pots to remove the food." "Great for rescuing an egg from boiling water or scooping pasta or vegetables from a small pot." If you are looking for one colander that can both strain spaghetti and fine foods like rice, this Amazon bestseller is the colander for you. Its made of stainless steel that won't rust and is heavy duty so you'll have this gadget for the long haul. The holes are tiny which prevent small grains from falling through but also help drain water faster and more efficiently. When you're all done cooking you can throw this in the dishwasher for cleaning. With an 89% of people giving this a 5-star review you know this is a winner. Reviewers say they didn't realize they could love a colander so much, and many people have purchased more than one since they love it much more than their plastic versions. This large, 5 1/2-quart colander has extendable nonslip handles that fit across almost any sink, so you can rinse vegetables or drain pasta while keeping the bottom of the colander safely above the floor of the sink. The fine mesh makes this great for rinsing rice or for straining soup stock — just make sure you’ve got a pot below to catch the stock —while the rectangular shape makes it convenient for rinsing carrots, celery, rhubarb, and other long foods that wouldn’t fit as well in a round colander. Made from stainless steel mesh, this won’t stain or rust, and it’s dishwasher safe for easy cleaning. If your colander needs are simple, this strainer fits the bill — and the budget. Made from white plastic, it has elongated holes for fast, efficient draining on pasta night, and it’s also great for rinsing vegetables from the garden. It holds 4-quarts. This has four feet that keep it elevated off the bottom of the sink, and the soft, nonslip handles make it easy to grab, so you can shake the water off your greens. For easy cleaning, this is dishwasher safe, and since it’s round, it might nest with your mixing bowls for storage. This stainless steel colander makes a fashion statement with its brushed interior, a mirror-polished exterior, and rolled edges, but it’s not just for show. It’s made to last with riveted handles that offer a firm grip. The pedestal bottom looks classy and offers a stable base that keeps the food off the bottom of the sink. Graduated holes drain quickly and help circulate air so your greens won’t get soggy if you prep them early. It can also serve double duty for storing onions or potatoes. This is dishwasher safe for easy cleaning. It holds 5-quarts. Made from silicone, this is heat resistant for draining hot foods, and it’s dishwasher safe for easy cleaning. This strainer is also available in other sizes if the 4-quart model isn’t perfect. Let’s face it — most colanders are used for draining liquid from pots —either to keep those cooked potatoes or pasta or to strain out the homemade stock and dispose of the bits and bones. This clip-on colander strainer does the job while taking a lot less storage space, and it clips on snugly without damaging nonstick surfaces. Made from silicone, this can handle the heat from boiling liquids. It’s flexible enough to fit just about any pot or pan you own, and it will even clip onto most mixing bowls to drain and strain. For simple cleanup, it’s dishwasher safe. 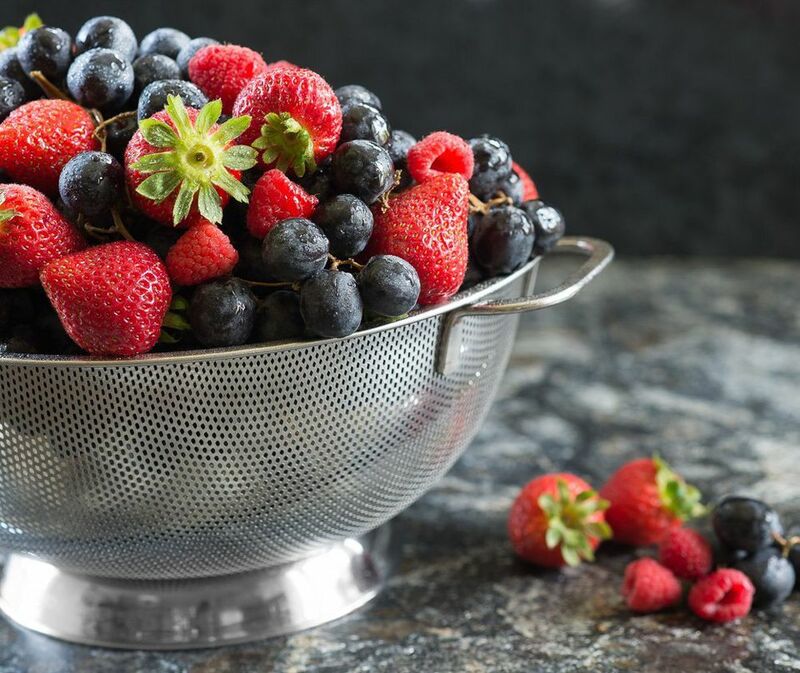 Using a giant colander to rinse a few berries seems like overkill, but this 1-quart berry basket and colander is made just for that task. The inner basket is removable and makes rinsing berries easy. Left in the container, the basket allows air circulation around the berries so they’ll stay fresher longer. A clear plastic lid keeps the berries safe from pesky bugs. How many times have you looked at a pot of cooked potatoes or other vegetables and wished there was an easy way to scoop out the food without lifting the big pot filled with hot water? This scoop colander makes that job simple, with a comfortable handle and a head that’s the right size and shape for scooping into pots to remove the food. Made from stainless steel, it’s heat safe, even for removing fried foods from hot oil. When you’re making soup stock, you can use this to remove and dispose of the large bones and bits, then strain the liquid through a fine strainer to remove the small bits and sediment. When cooking is done, this can be used for plating or serving vegetables, rice, beans and more. And when dinner is done, this is dishwasher safe. A hole in the handle makes this easy to hang for storage if you prefer. Sometimes you just need a small colander, and this spoon colander is the perfect fit for those times. Shaped like a ladle, it’s great for rescuing an egg from boiling water or scooping pasta or vegetables from a small pot. This also might be the cutest colander you’ll see, designed to look like the Loch Ness monster. Made from toughened nylon, this is dishwasher safe for easy cleaning.